Salt Lake City, Utah – March 28, 2018 – Salt Lake City is in the midst of planning a new trails network for the foothills, more or less from City Creek Canyon to the Hogle Zoo area. The trails will be mostly mountain bike accessible, some downhill only, and some hiking only. Up to 55 miles of new trails may be built in the coming years. Attached is an announcement and open house invitation concerning our Foothills Trail System Plan. 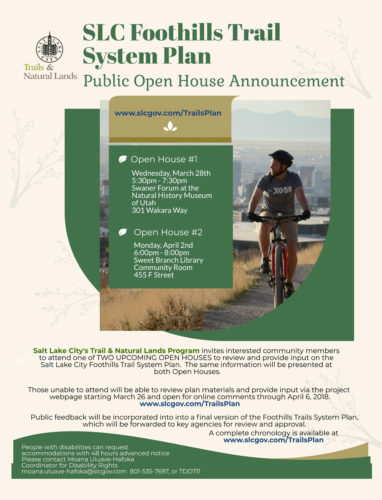 The primary objectives of the SLC Foothills Trail System Plan are: (1) to provide detailed layout, design and management recommendations for a high-quality non-motorized recreational trail system that is safe, enjoyable, accessible, connected, and sustainable; and (2) to provide information to guide strategic implementation of the trail system over a 10-year horizon. The plan includes foothill open space lands on the east side of the city, extending roughly from Emigration Canyon to North Salt Lake. We hope to see you on one of the two scheduled Open Houses!